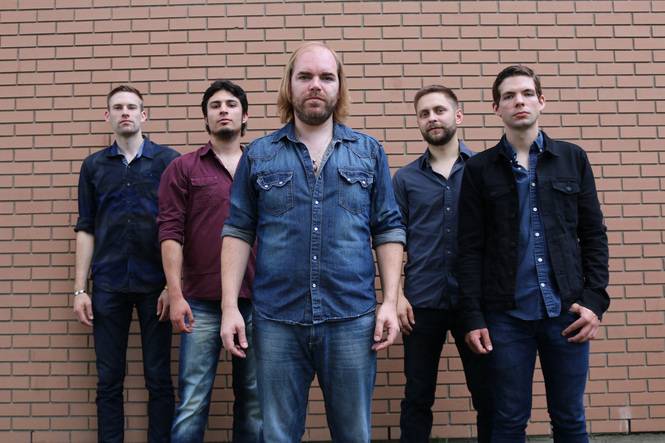 Among Canada’s fastest rising stars, The Dungarees have performed at marquee festivals including Boots and Hearts Music Festival, the Calgary Stampede numerous times, Big Valley Jamboree, Country Thunder, Dauphin CountryFest and SunFest. Gracing arena stages, the band has proudly opened as direct support for Blake Shelton, Reba McEntire and Miranda Lambert, all at the Saddledome in Calgary, and opened for the legendary Dwight Yoakam in October 2016 for three shows. The Mbira Renaissance Band will have any audience on its feet and dancing! Based in Edmonton, Alberta, Canada. The band delivers an afro-fusion, Thomas Mapfumo, Andy Brown and Bhundu Boys inspired sound that pays homage to the rich, ancient, musical genre of mbira music which has its roots in Zimbabwe. The members make up an eclectic group; drawing on their musical backgrounds in jazz, rock, traditional Zimbabwean music and reggae. The Mbira Renaissance Band regularly performs at the Blue Chair Café, and and the Blackbird Café. ​Ruby & the Hitmen have dedicated their music to the 60's and 70's. Great cover band for casino lounges and corporate events. This band is a 6 pc consisting of 2 guitars, bass, drums, keyboards + Rene fronting the band. Lots of harmonies. ​Listen and see some video ! When you come to a Rave On show, expect to hear a variety of music that spans decades. The group’s repertoire is time tested and crosses many genres. From past reputation, people “Rave” about this four-piece band. If you can’t dance to it, Rave On won’t play it. Hawrelak Park and many other venues. The band has recently released their first studio recorded album "Walk the Tweed" and is working on new material for their next album. By Rick Shermack and Kerry Doyle. Presto…..The Rum Bros were born. They brought their mix of great music, (70’s and 80’s rock, country, disco and Vegas…mixed with hilarious costumes and props, and LOTS of interaction with the audience. In 2005, they added in a full backing band and brought the show into overdrive. Rick left the band in 2010 and the Rum bros “band” shut down in December 2014. And the Original Rum Bros. Duo was relaunched! Completely new studio backing tracks. A song list upgraded to include hits from the 70’s to today. Costumes, props, fun, dancing and as we now say…repeat! The Elk Point Community Lions group hosted a Dinner for Diamonds, ladies night out and the the entertaining, awesome Rum Bros was our evening entertainment. Their range of songs and entertainment style brought laughs, clapping, singing and dancing! We would recommend them to anyone in the need of humorous entertainment and a variety of music genres. Thank you to Duke Agency for the recommendation and a big shout out to Rick and Kerry for a fabulous evening had by all. Terri Hampson on behalf of the Community Lions Group. ​​VERA's music is modern in tone, but with vintage throwbacks to classic rock, pop, blues and soul music. Their music is energetic and emotional, and their live show experience mirrors this. Lush keyboards, searing guitars and tight harmonies all backed up by a solid and funky rhythm section. Both onstage and on record, VERA commands attention and always delivers a reason to keep moving, keep grooving, and keep listening. What can you say about a band that plays all Beatles? they play hit after hit. For a themed event, car shows, 50's - 60's music or private parties or something a bit different _ consider Pepperland. You know all the songs guaranteed. For audio and video _ please check out the bands website. 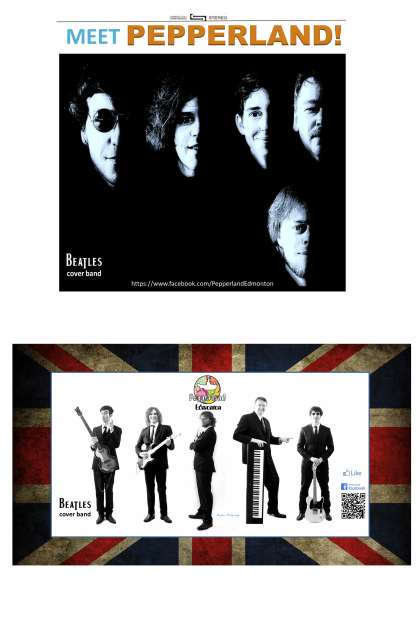 "Beatles cover band Pepperland will rock the house after Mayor Stephen Mandel — who’s planning to attend his second show, on the 29th — makes an official proclamation commemorating the music legend’s visit to Edmonton." David Keeling “Bestest fun last evening, thank you all for working so diligently to help create an event that people will be talking about for years! "Glad I hired Pepperland for our Canada Day event. They brought great energy, people were singing along and I had some great comments afterwards!" "Pepperland was amazing! Very talented group that went above and beyond. Not only did they rock it, but they also helped with wedding setup and preparation. Trish and I would recommend Pepperland to anyone. All of our guests loved it to. Thanks for everything Carol, you were great to work with as well. " "This band was Awesome. I would HIGHLY recommend them to anyone. Nice guys too! for such artists as The Bay City Rollers, The Odds, Trooper and Kenny Shields of Streetheart. Theme song for the Alberta Summer Games. The members of the Black Velvet Showband are no strangers to the Edmonton Music Scene. Each individual has a career spanning several years and most of the individuals have played professionally some of the most memorable venues around the greater edmonton area. Many of the venues have come and gone - but these guys have carried on. Some of them have band experience, along with solo careers, duos and alike. Amie Weymes and the Atta Boys are a high energy, danceable party band delivering new and classic hits from your favourite Rock, Pop, Count​ry, and Celtic artists.Perfect for any occasion, let Amie Weymes and the Atta Boys rock your party soon! Amie Weymes grew up in Mullingar Town of Co. Westmeath in Ireland. Early in her career, Amie fronted Ireland’s Dixie Chicks cover duo called “The Cherokee Chicks” and toured extensively through Ireland. Amie also performed as a solo artist in Ireland, playing soft seat pubs and lounges across the country. In 2012 Amie began gracing Edmonton’s local livery such as Sherlock Holmes, The Atlantic Trap and Gill and Rose and Crowns. Amie prides herself on providing a constant variety of rock, country, pop, and Celtic sing along favourites all performed in a contemporary style. Amie was a Nashville NorthStar Finalist at the Calgary Stampede 2013 where she was selected to compete by a panel of Judges from the Canadian Country Music Association. Amie was a top 6 finalist where she performed on the same stage as some of the biggest names in Canadian Country Music.